Earlier this week word got out MLB and the MLBPA are close to finalizing a series of sweeping rule changes set to take effect next season. As part of those changes roster sizes would increase to 26 players, though only 13 can be used for pitchers. Under the proposed plan, the standard online voting would take place starting this year. 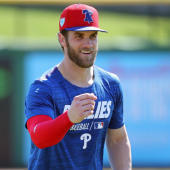 Upon its completion, the top three vote-getters at each position in each league would be on the ballot on Election Day, and whichever players received the most votes on that single day would determine the All-Star starters, according to sources. The idea is to create buzz and increase social media engagement with that one-day vote to select the All-Star Game starters. You can be sure the individual teams will hold massive social media campaigns promoting their players. As an added bonus for the league, the one-day vote would generate another wave of clicks over to MLB.com's voting page, which equals advertising dollars. Passan adds MLB and the MLBPA are also discussing increasing prize money for Home Run Derby in an effort to lure more big name players. As recently as 2017, Home Run Derby participants received only a $1,000 stipend plus travel and hotel accommodations, and complementary tickets to the Home Run Derby and All-Star Game. Not much of an incentive there. While the new timed format has livened up the event, each year several big name players decline Home Run Derby invitations -- 2017 winner Aaron Judge passed on the event in 2018, for example -- and that's a bummer. MLB can not force players to participate in the Home Run Derby, but perhaps an added financial incentive would draw some bigger names.